The 354th Soundtrack of the Week is Asei Kobayashi’s music for the 1969 TV series Flower Action 009-1. It’s a great CD with lots of cues in various cues. There’s lots of surf, lounge and acid rock influences. The very groovy theme song is performed by “Zero Zero Girls”. 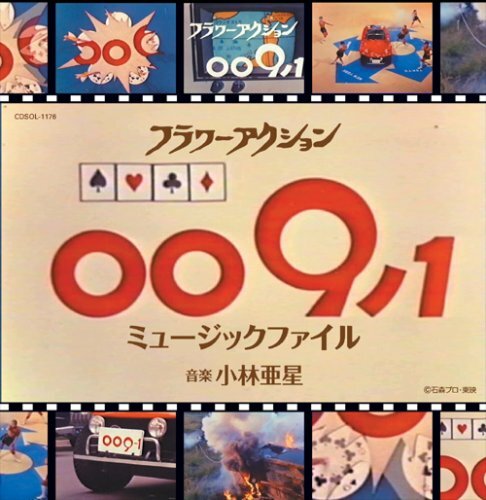 There isn’t much in the way of lyrics: a lot of “009-1”, a countdown from 9 to 1 and some wordless vocalizing. There’s a psychedelic guitar solo and a killer groove throughout. In general there’s a ton of great guitar playing and incredible rhythm tracks on these tunes. Do yourself a favor and watch the opening credits here. The show looks like it was pretty awesome.